Abu Muhammad al-Husseini al-Hashimi was not the only person inside the Islamic State to write a scathing critique of the organization's overall direction in summer 2017. A certain Abu Abd al-Malek al-Shami, about whom little is otherwise known, also wrote a highly critical work that is the subject of this post. Like Hashimi, Shami was also based in the Deir az-Zor area of eastern Syria when he wrote his critique, which consists of a main body of text written in Dhu al-Q'ida 1438 AH (i.e. late July-late August 2017) and then an appendix written on 3 Dhu al-Hijja 1438 AH (c. 25 August 2017). Stylistically, Shami's work is much simpler than Hashimi's work, as he notably avoids quoting lines from poetry. There is also a tendency to repetition in Shami's work. Ideologically, Shami falls in the same camp as Hashimi. He is critical of the Delegated Committee for issuing the controversial May 2017 statement (retracted in September 2017) that declared takfir of the idolaters to be among the open/evident principles of the religion. As such, he believes that extremists have gained too much sway in the organization, whereas the real scholars and students of Islamic knowledge have been marginalized, persecuted and killed. 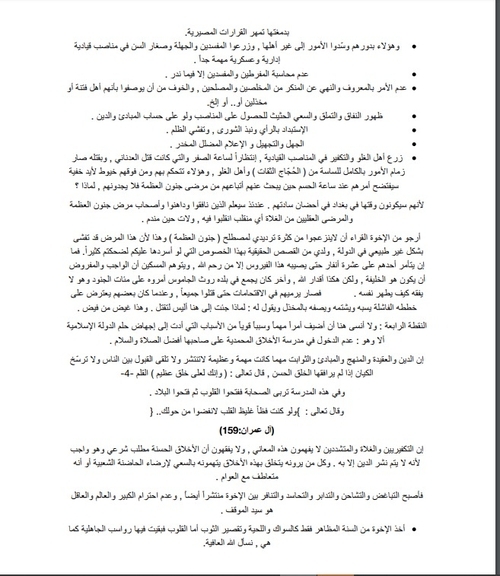 A statement issued in 2016 by the Central Office to Track the Shari'i Diwans is portrayed by Shami as a prelude to the extremism that was to dominate. Meanwhile, as in Hashimi's work, the Islamic State's leader Abu Bakr al-Baghdadi is portrayed as a distant and absent figure, who has wrongly entrusted matters to the ignoramuses of the Delegated Committee. Shami urges Baghdadi to intervene and make clear that his own manhaj (direction/ideological creed) is opposed to that of the extremists. - The squandering of military manpower and resources, with no effective military tactics and strategy to defend areas. It is a disaster that the Islamic State has lost huge amounts of territory and withdrawn from so many areas. - Marginalization of the Hisba apparatus. - Interference in the functioning of the judiciary. Where Shami differs from Hashimi is the former's repeated emphasis on the idea of a conspiracy that has penetrated the highest ranks of the Islamic State and is working to elevate extremists in order to create internal strife in the organization. In particular, Shami argues that at the highest levels are people on the payroll of the Iraqi government (cf. here on this controversy), and some of them who are among the 'Hujjaj' (singular: 'hajji'- a term in Islamic State parlance for senior members of the group, who are also dubbed 'thiqat' or 'trusted ones') are probably already in Baghdad. For comparison, one should note some senior Islamic State figures who had the nickname 'Hajji', such as Hajji Bakr (killed in January 2014), al-Hajji Iman/Hajji Taher (Abu Ali al-Anbari) and Hajji Mu'atazz. Shami's line of thinking is quite different from the argument that the Islamic State is infiltrated by Iraqi Ba'athists. 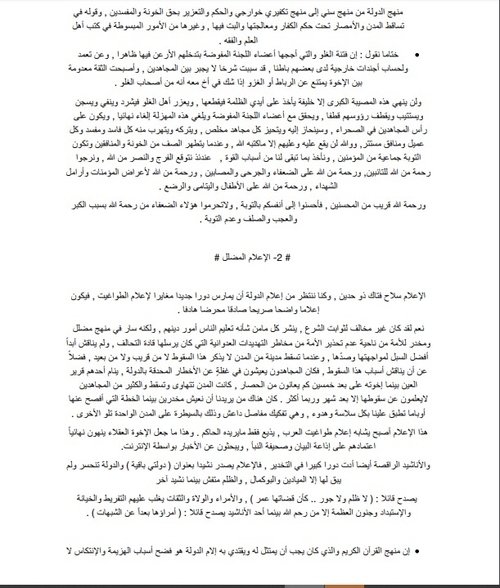 Though the author does note that some 'Hujjaj'/'thiqat' have a background in the Saddam-era army and the intelligence services, he does not claim the Islamic State is controlled by Iraqi Ba'athists, but rather the background can entail negative characteristics in certain 'Hujjaj'/'thiqat' like lack of real knowledge of the religion and dealing with people according to a 'Jahiliya' (pre-Islamic ignorance) mindset. Although Shami and Hashimi both mention the Islamic State's media critically, their focuses in this regard differ. Hashimi's primary mention of the Islamic State media is in relation to its lack of official eulogy for the Bahraini scholar Turki Binali (a figure also admired by Shami and similarly critical of 'extremists' in the Islamic State). That is a minor part of the work. In contrast, the issue of the Islamic State media is much more prominent in Shami's critique. He lambasts the organization's media as misleading for never discussing the fall of various localities into the hands of the enemy and the reasons behind it, while promoting nasheeds like 'Dawlati Baqiya'. He also attacks the Islamic State media apparatus for exploiting Islamic eschatological literature and applying it to the organization and its situation. Such application, Shami argues, is not allowed without decisive lines of evidence because the Islamic texts on this matter are precise. Along with his criticism of the Islamic State's media, Shami attacks the official spokesman who succeeded Abu Muhammad al-Adnani: Abu al-Hassan al-Muhajir. This individual, according to Shami, is unknown to the mujahideen and lies in hiding, so how could he possibly be appropriate for inciting the mujahideen to be firm and patient? Besides, Shami critiques al-Muhajir's attempts to liken the Islamic State's situation to that of the era of the Prophet Muhammad.
. The Soldiers Diwan (military department) was apparently led by a Kurdish person at one point (Abu Hamza al-Kurdi).
. Shami's critique of the 'retreat to the desert' tactic: this line of strategic thinking became well-known in the last speech of Adnani. Some analysts draw attention to it as a sign of the Islamic State's resilience. For Shami, however, this idea is misguided and reflects the failure of the Islamic State as a state project, even if Adnani (whom Shami admires) proclaimed it.
. Adnani designated $500,000 to fortify Manbij. Apparently this money all went to waste in petty expenses for the Diwans.
. It has been known that the Islamic State had a military academy for lectures on warfare and tactics, but Shami derides the whole enterprise as a farce.
. A decision was made to arm and train women for combat, but the decision (like the decision to institute conscription) came too late in Shami's view. The display of women in combat was subsequently broadcast in an al-Hayat Media release. 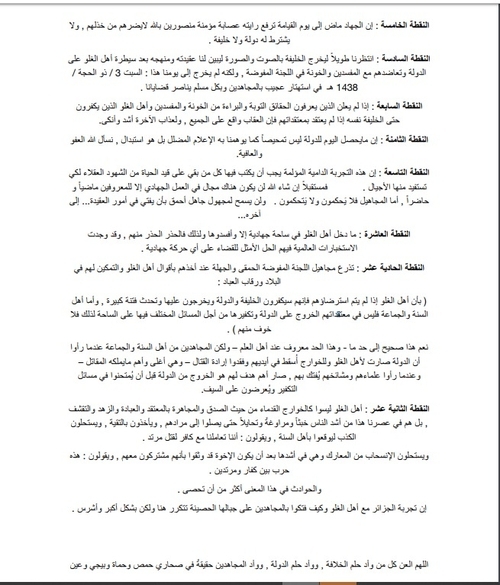 Below is the full testimony in the original Arabic with translation. Any parenthetical insertions in square brackets are my own. Praise be to God who makes the religion dominant even after some time, and prayers and peace be upon the strong, the trusted, and all his family and companions. As for what follows: this is a short message from one of the soldiers of the Islamic State to whosoever is concerned about the issue of the Caliphate and establishing the law of God in the land. "As there came to you from above and beneath you and the eyes wandered and the hearts reached the throats and you assumed various things about God, then were the believers tested and greatly shaken, and as the hypocrites and those in whose hearts is an illness said: 'God and His Messenger have only promised us lies" (al-Ahzab 10-12). I do not find a description for our state of affairs that is more true and informative than these noble verses as the planes that bomb and travel above us, and the disbelievers and apostates besiege us, and the hypocrites and spies come and go among us, and the masses and nomads await our disappearance. In addition to the things mentioned above that resemble what befell the Muslims in the expedition of the Trench, there is something of extreme danger that is indeed the biggest cause of the defeat, and it is the infiltration of traitors and spies and their reaching the highest positions in the Dawla, and their possession of the red stamps and their attaining the quality of 'al-thiqa' or 'al-hajji', and these people will as such be immune from inquiry and punishment, and they will be above suspicions, and they are not asked about what they do, and their deeds and words however sick and disobedient they might be, it is not allowed for anyone to describe except as wisdom, intellect and cleverness and good policy. And if they do or say what must be punished, rebuked, inquired about, and held accountable, they are reprimanded only very lightly. And they may move from the person they are in to another position equal to it in importance and danger, and they may not be transferred, but rather one of them continues in his position however oppressive his actions have been in order to complete the path of destroying the Dawla from the spine according to the orders of his masters directing him. And we here, however much we uncover connections and demonstrate thoughts and suspicions, no one will be interested in what we say except the one who examines with his eye, investigates with his insight what we present from them and other things from that through which he has passed via his moving about in sensitive positions in the Dawla. And that is on condition that he removes the veil of cold caution from his eye, and the cover that is on his heart and whose cause is mixing with these traitors and corrupters and being silent about their hideous deeds. And this will not be except by true repentance and returning to God, and that he remembers that we have not migrated and support except for the sake of God, and we pledged to God that for His sake we should not be taken in by the blame of a blamer, and that we should preach the truth, and that all should know that God will certainly support us even if we were not to have left a single neighbourhood from the neighbourhoods of al-Mayadeen or Albukamal but this is on condition of clinging to a rope entirely and announcing repentance and exposing the traitors and corrupters and expelling them from our midst. Otherwise, let us await what God has threatened us with in the Almighty's words: "And fear fitna that will certainly not strike only those of you who have oppressed, and know that God is severe in punishment" (al-Anfal 25). So fear God oh you who know the facts. Preach the truth, and expose the traitors. And fear God's punishment that will strike all, and for us is a lesson in the dozens of towns, localities and villages that have fallen. Fear God for the widows of the martyrs and women of the muhajireen [foreigners] and ansar [local Syrians/Iraqis] who trusted you and brought their woman and children thinking that the Dawla would protect them. Fear God for the thousands of injured and wounded with whom the hospitals, guest rooms and mosques of al-Mayadeen and Albukamal are crowded: those who are suffering from neglect. For some of them have become addicted to sedatives, and others hope for death because of neglect. Fear God for the thousands of mujahideen and administrative officials who have been struck with conceit and delusion because of the misleading media that conceals from them the news of the defeats and routs and their causes and the people who cause them, while overlooking the fall of the towns and capitals and only resounds with the dancing anasheed [nashids] that make the Ummah numb and make it think that matters are fine. Fear God for successive generations of children who would be graduating from the womb of the Dawla as mujahideen fighting the forces of local and global kufr [disbelief], and who by betrayal will instead become captives along with their mothers among the disbelievers as happened in Mosul. Fear God oh you whose repentance and return we seek as you still circulate in the orbit of the traitors and oppressors and are silent about their destruction and calamities. Heal yourselves from the conceit and delusion and megalomania that has afflicted you because of the positions that the traitors and oppressors have appointed you to, and because of a car, device, pistol and limited number of dirhams [type of currency] of petty cash and other things: all of these things will be of no use to you before God on the Day of Judgement. Who are the 'thiqat' or 'hujjaj'? Thiqa: a person who has participated in the fighting with the one who has made him thiqa or was a companion for him in prison or colleague for him in seeking knowledge, or an old friend in the army of Saddam, or a member in the Iraqi intelligence services who announced his repentance and brought chests filled with gold and silver bullion and has suggested that they be the nucleus for issuing the state of the Caliphate's currency!! So do the likes of these people betray?? The one who has given the likes of these people the quality of thiqa and has dubbed them hajji has ignored the fact that we are in the endtimes, and has forgotten that man may become a disbeliever by morning and may become a believer by evening and vice-versa, and that steadfastness on the religion and truth is mighty in the likes of these days and that the friend may betray his friend, and that the believer may be tempted by rank and position and by the material world in general. He has also forgotten that the disbelievers work night and day to penetrate the entity of the mujahideen and plant agents among them to snuff out the dream of the Islamic State, induce the abortion of the Caliphate an tear down the banner of jihad and fighting in God's path. And the calamity is that some of the ignorant have become convinced that the thiqa is infallible and so we have become like the Rafidites [Shi'a] who assert the infallibility of the Imams from the family of the Household. And the thiqat or 'Hujjaj'; among them are members in the Delegated Committee, and among them amirs of the Diwans, and among them walis [regional/provincial governors] of the regions, and among them amirs of the brigades, and among them those who direct affairs from behind the veil. And in the shade of darkening and spreading of ignorance adopted in the Dawla, our enemies know about the Delegated Committee and its members more than what the mujahideen themselves know. And reaching these people is nigh impossible, and to make this clear we say that the walis and amirs of the Diwans themselves cannot meet the members of the Committee or speak with them over the phone except through a secret security apparatus called 'tawasul' [contact]: so how can the unkempt and dusty mujahid brother reach them to air a grievance or complain? 1. A planted agent to whom orders and directives come from the outside. 2. The one who has precedent in imprisonment, jihad and virtue, but has become afflicted with the megalomania and blindly obeys the first type without discussion. 3. The old friend and he is one whose repentance was sought: possessing little knowledge or ignorant except what they taught him in the repentance course, and he deals with the mujahideen and all around him with the same Jahiliya mindset on which he was raised during the rule of the Ba'athists. And he also blindly obeys the first type because he owes him due credit. And in short for my time and the time of the reader I say: someone may respond and say: this is all false and untrue with no evidence for it.
. The task of exposing the traitors and agents and negligent ones and corrupters present at the very top is the task of the Caliph and his special security apparatus but where is the Caliph for all that is happening? And does he have a special security apparatus?
. The simplest people of those affiliated with the Dawla have become convinced that the Dawla is infiltrated in its highest leaderships and especially after the assassination and killing of al-Adnani (may God forgive him) and a number of the leaders of the Dawla. Despite that, no investigation and no inquiry.
. We only have a small piece of land comprising al-Mayadeen, Albukamal and some of the villages between them, and some of you (and I mean here the thiqat) adopt the opinion of withdrawing to the desert, and some of you adopt the opinion of fortifying inside the towns until death. So what is your opinion oh thiqat- so long as you will die with us of thirst in the desert or under heaps in the towns- that you present us with some personal information about yourselves? Your real names? And who is wanted by the Iraqi government and who is not? And who of you still receives a pension from the Iraqi government till this day of ours? And how about you mention these matters in a special release issued by the central media in voice and picture? Believe me, this will refute all who accused you, and it will increase the increase between you and the mujahideen, and the condition is that all should appear in the release, and whoso does not appear in the release and the mujahideen demand their appearance, they must appear in a second release and likewise until the mujahideen become assured that their leaders will be killed alongside them, as an example for them, their women and their children, and that what will happen to them will happen to their leaders.
. Why have the cries of the warners and calls of the reformers come late? 1. Thinking well of and being deceived by the religiosity and piety, especially as the agents and corrupters always have Shari'i justifications for all that they do. 2. The preoccupation of the devoted with the fronts, fighting and serving the mujahideen, and whoso is an administrative official, they occupy him with office and paper works and monthly reports. 3. Events have proceeded quickly in a terrifying manner: for our minds can scarcely comprehend the fall of a town as we sit to ask each other about the cause, and soon enough we are taken by surprise with the fall of another town and likewise until we have been confined in al-Mayadeen and Albukamal. 4. Administrative and media covering up of the defeats and widespread corruption. 5. And the one they find of the reforming advisers to be constituting a danger to them, they send him to the front to be killed there. And I conclude this preface of mine by asking to be excused by the brothers reading this if they find spelling errors or the like or inadequacy in some of the sentences and words, for I am now writing in rough draft without polish in the shade of difficult circumstances that only God and those who are in a state similar to mine know. For we are suffering from the siege of the disbelievers and the oppression of those near and God is the One whose help is to be sought. The Almighty has said: "And indeed We test you with something from fear and hunger and lack of money and lives and resources, and give good tidings to those who endure" (al-Baqara 155). We ask God to be among those who endure and for God to save us from the despotism of the oppressors who don the garment of the mujahideen and pious. Ameen. 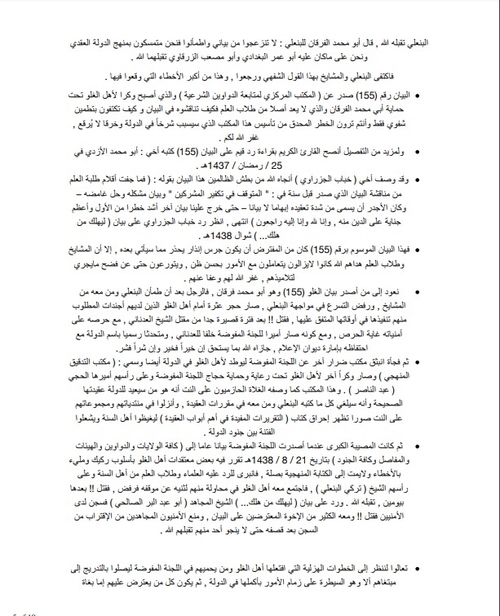 And excuse me that I will write what I want to affirm and clarify in the form of consecutive points that may not have a methodological connection between them according to what we have learned through our higher university studies about how to write studies of knowledge. For the thoughts are dispersed, and I am alone here and I have no guide points except some of the stories and notes I would note and some of the articles from the Internet, and we are awaiting death in any moment, but I think that before death I must expose the traitors and corrupters, and I call on God- Almighty and Exalted is He- to make in what I write a reminder and benefit for the coming generations that will bear the banner after us. And the reader will notice I write with great brevity most of the time and the reason is as I mentioned previously and time is not with us but against us. Oh God, show us the truth and provide us with the sustenance of following it, and show us the falsehood as falsehood and provide us with the sustenance of avoiding it. 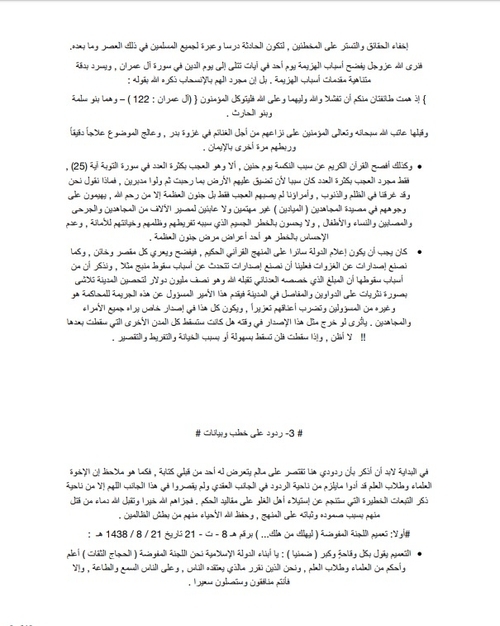 The people of extremism are a group who have joined the Dawla, and the ones who have established their madhhab that they declare takfir on the masses and Islamic societies in their entirety, and they assert chain takfir, and takfir of the one who excuses in ignorance, interpretation in absolutes and other disastrous errors. And among them are those who have gone so far in their extremism that they assert what the Azariqa from the old Khawarij have asserted. And among these people are extremists from Tunisia who studied under a sheikh called al-Hazimi who was sent by the Saudi intelligence after the Tunisian revolution so he sowed whatever corruption he could in the youth and disseminated his evil seed from which we are still suffering until today. And among them are Egyptians from the Qutbi extremists, and from the followers of Shukri Mustafa who assert hesitation on individuals until their kufr or Islam becomes clear, and they are well-known in the state of the Caliphate as the group of Abu Muslim al-Masri, who received the amirship of the Diwan al-Qada for a time. And these people, as far as I know: no proof was found against them of any involvement in the issue of extremism until I left Raqqa, soon after the rumour of the collapse of the dam. And among them are Jazrawis and Azerbaijanis and Turks, but their numbers are small in comparison with the Tunisians and the Egyptians from the extremists, and all the extremists despite the different degrees of their extremism and difference of their madhhabs surprisingly sympathize with each other and cooperate with each other.
. The Dawla, since the beginning, has made clear its manhaj that contravenes the people of extremism for it has published books, broadcast sermons and in particular what was on the tongue of its official spokesman al-Adnani. Then the discussion and debate began with the one openly displaying the doctrines of the people of extremism. And some were sentenced to death after they insisted on their creed and their takfir against the ones leading the Dawla. Up to here and it seems to the one who follows matters that the situation became under control and that the issue of the ending of the people of extremism in the Dawla is a matter of time only.
. 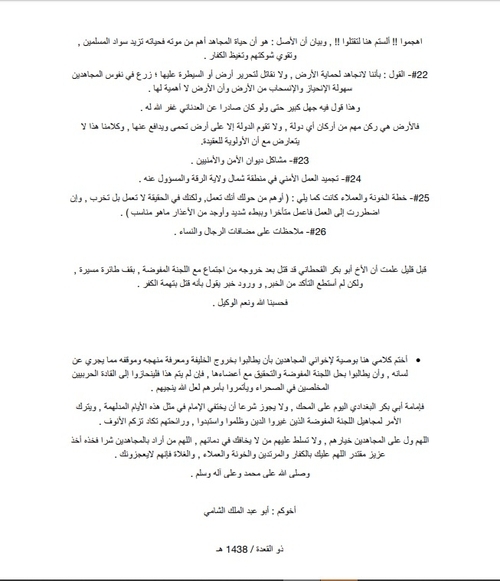 But in so far as the issue has intelligence distance, the heads of the people of extremism have aroused it again, for they began with Sheikh al-Adnani and stirred up with him the issue of "the ruling on the one who hesitates in takfir of the idolater," for he rejected agreeing with them and was harsh in words against them so he was killed!! Then the same issue and other issues were stirred up with Hajji Abu Muhammad al-Furqan and he was a Hajji in the Delegated Committee and amir of the Media Diwan.
. They condemned him and reprimanded him for his words to Binali and others of the mashaykh who had seen him on the statement issued by the office that he directed personally and established to please the people of the extremists in order for the carpet to be pulled out little by little from underneath the Research and Studies Office that Sheikh Binali (may God accept him) directed. Abu Muhammad al-Furqan said to Binali: Do not be angered by my statement and be assured we are adhering to the doctrinal manhaj of the Dawla and we are on what Abu Omar al-Baghdadi and Abu Mus'ab al-Zarqawi (may God accept them both) were upon. So Binali and the mashayakh were content with these veiling words and returned, and this is among the biggest mistakes they fell into.
. The statement no. 155 issued by the 'Central Office to Track the Shari'i Diwans' that became a den for the people of extremism under the protection of Abu Muhammad al-Furqan who is not considered originally among the students of knowledge. So how could you discuss with him the statement and how could you be content with verbal reassurance even as you saw the mortal danger from the establishment of this office that would cause a fissure in the Dawla and a tear that could not be mended? May God forgive you.
. For more detail, I advise the dear reader to read a valuable response to statement no. 155 written by my brother Abu Muhammad al-Azadi on 25 Ramadan 1437 AH.
. And my brother Khabab al-Jazrawi (may God save him from the despotism of the oppressors) described this statement with these words of his: "The pens of the students of knowledge did not shun discussion of the statement that was issued a year ago on 'The one who hesitates in takfir of the idolaters' and affirming its problem and resolving its obscurity. And it was more deserving to be called from the sheerness of its confusion obscurity and not a statement- until another statement came out against us, even more dangerous than the first and an even greater crime against the religion than it, and indeed we belong to God and to Him do we return"- see the response of Khabab al-Jazrawi to the statement "That the one who perished should perish.."- Shawwal 1438 AH.
. For this statement no. 155 was necessarily going to be a warning sound of what was to come after it, but the mashayakh and students of knowledge (may God guide them) continued to deal with matters with good thought, and hesitated even from exposing what was going on to their students. May God forgive them and absolve them.
. We return back to the one who issued the statement of extremism (155) and that is Abu Muhammad Furqan. For the man, after assuring Binali and those with him of the mashayakh, and rejection of hastening to confront Binali, became a stumbling rock before the people of extremism who have agendas they are required to implement at the agreed upon times, so he was killed!! This was so a very short time after the killing of Sheikh al-Adnani, despite his extreme regard for his security procedures, and despite the fact he became an amir for the Delegated Committee in succession to al-Adnani, and an official spokesman in the name of the Dawla as he held the amirship of the Media Diwan. May God reward him with what he deserves: if good, then good, if bad, then bad.
. Then by surprise another harmful office emanated from the Delegated Committee in consolidation for the people of extremism in the Dawla as well and it was called the "Manhaj Verification Office" and it became another den for the people of extremism under the supervision and protection of the Hujjaj of the Delegated Committee at the head of whom was their amir Hajji Abd al-Nasir. And this office as the Hazimi extremists described it on the Internet was the one that would restore to the Dawla its correct doctrine and would annul all that Binali and those with him wrote in the doctrine courses, and they published in their forums and groups on the Internet photos showing the burning of the book "Beneficial Courses in the Most Important Aspects of Doctrine" in order to enrage the Ahl al-Sunna and kindle fitna among the soldiers of the Dawla.
. Then the biggest catastrophe was when the Delegated Committee issued a general statement to "All the wilayas and Diwans and Commissions and Sectors and All the Soldiers" on date 21 Sha'aban 1438 AH in which some of the doctrines of the people of extremism were established by a weak method and filled with errors and bearing no relation to manhaj writing. So the 'ulama and students of knowledge from the Ahl al-Sunna sharpened to respond to it, at the head of whom was Sheikh Turki Binali, so the people of extremism met with him in a bid on their part to dissuade him from his position but he refused, so he was killed!! That happened to him (may God accept him) only two days after. And the mujahid sheikh Abu Abd al-Birr al-Salihi responded to the statement "That the one who perished should perish..." so he was imprisoned by the security personnel and was killed!! And with him were many of the brothers opposed to the statement, and the security personnel prevented the mujahideen from going near the prison after it was bombed so that none of them (may God accept them) could be saved.
. Come, let us look at the farcical steps the people of extremism and those who protect them in the Delegated Committee have undertaken in order to reach gradually their desire: namely, seizing the reins of affairs in their entirety in the Dawla, then all opposing them are either transgressors revolting against the Imam, or Jahmite apostates who can be killed and their wealth stolen and their women taken captive. And this is what I have explained to be the desire of the people of extremism and pure Khawarij. 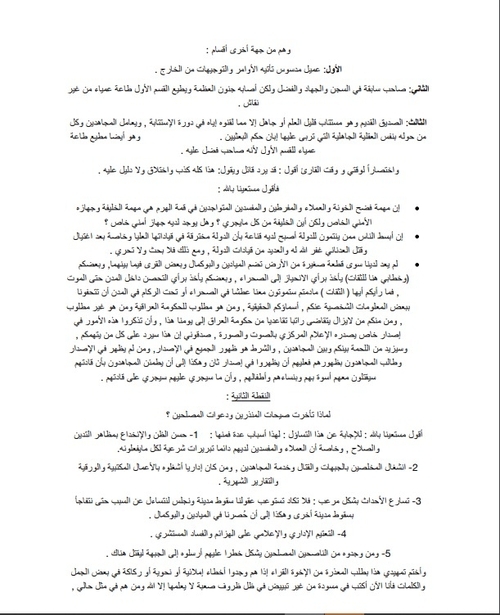 As for the desire of the agents of the intelligence services among them, it is for vicious infighting to occur between the people of extremism and the Ahl al-Sunna in the last base for them and it is the town of al-Mayadeen so each side destroys the other, and this will leave vulnerable many of the victims who will be killed by the coalition and its followers, because as is well-known, the mujahideen will fight fiercely with no comparison to it when they are besieged in their last base.
. 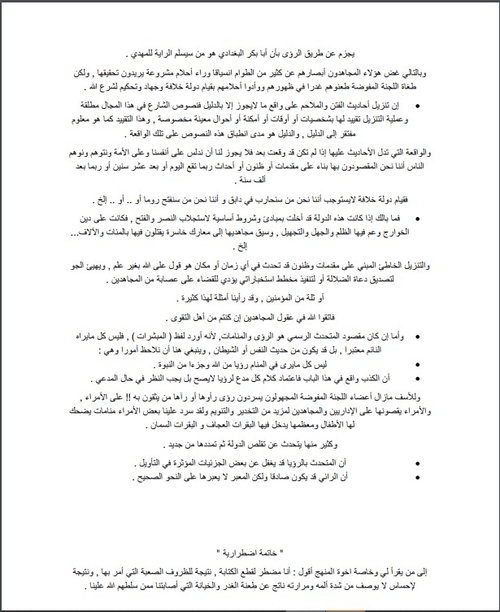 Issuing a speech by an unknown person from the people of extremism that spread among the soldiers of the Dawla, describing what occurs from injustices in the Dawla, and establishing in it some of the issues of the people of extremism through affirmation and allusion while threatening and making threats.
. The Delegated Committee gathered in a theatrical play with roles memorized to consider the matter and exaggerate it so Hajji Abd al-Nasir appointed one of the members of the Committee- the ignoramus feigning knowledge whose activist name is Abu Zayd al-Iraqi- to write a response observing calmness and defusing tensions between the Ahl al-Sunna and people of extremism so the statement "That the one who perished should perish" bearing inside it the establishment of the madhhab of the people of extremism in weakness and obscurity with underhanded dealing and threatening all who oppose. And I do not conceal from you that when I read it for the first time, I felt as though I was reading one of the statements of the commission of elders of the Saudi 'ulama.
. All were convinced that this issue is of the issues of Shari'i politics, and the authority and whoso represents him must decide upon it, and in so far as the Caliph was concealed in a vault the meaning in practice was the Delegated Committee. And when some posited in opposition that this is an issue of Shari'i doctrine, and that the Shari'i officials must decide upon it, these people were faced with derision and mockery and words: that the Shari'i officials are the foundation of the problem and that the conflict is going on among them and that referring the issue to them is something that will cause more conflict, so the oppositionists fell silent reluctantly.
. The oppositionists forgot that the Delegated Committee is the one that rehabilitated the heads of the extremists and disregarded their receiving of leadership and Shari'i positions.
. And now there are verbal orders not to engage in this issue.
. We now write on date Dhu al-Q'ida 1438 AH: that is, more than 80 days after the issuing of the statement "That the one who perished should perish" dated 21 Sha'aban 1438 AH and until this day no retraction, correction or commentary on this statement as been issued by the Delegated Committee, despite the fact that Binali responded to it two days later and Abu Abd al-Birr responded to it a week later, and Khabab al-Jazrawi responded to it in the beginning of Shawwal, and Abu Othman al-Najdi responded to it in Ramadan. I reviewed and read these responses, and as for ones I was informed about by ear, they are numerous. And all of them are serious responses of manhaj crowned with fine elegance and respect for the ones addressed in them: that is, members of the Delegated Committee. And those who wrote them are 'ulama and students of knowledge whose compositions, addresses and discussions and lessons bear witness to them.
. So what was the response to them? Killing, assassination, imprisonment, marginalization, pursuit and being hunted.
. We heard in what has passed that in so-and-so state there happened a white coup and that the so-and-so head was killed in a red coup: i.e. bloody.
. And as for what has afflicted us today in the state of the Caliphate, it is a black coup; because it is an attack on the doctrine and manhaj of the Dawla, and replacing its manhaj that is from the manhaj of the Ahl al-Sunna with the manhaj of the people of extremism and the Khawarij. And if we were to be exact on dates, we would see clearly how the prayer of al-Adnani (may God forgive him) in his famous mubahala was responded to since the people of extremism reached the Delegated Committee, for the towns and localities have begun falling one after another and collapsing, and the leaders are being killed. "...Oh God, if this Dawla is a state of Khawarij, break its back, kill its leaders, bring down its banner, and guide its soldiers to truth. Oh God, if this is a state of Islam that rules by Your Book and the Sunna of Your Prophet and wages jihad against Your enemies so make it firm and mighty and give it victory and enable it in the land, and make it a Caliphate on the Prophetic Methodology"- from the clip "This was not our manhaj and will not be."
. We witness today tyranny in opinion that has no comparison, and marginalization of the people of knowledge and the Shari'i officials from the Ahl al-Sunna after the most prominent of them were killed and some of them were imprisoned.
. And we witness today that the people of corruption, the people of extremism and the ignorant and people of psychological illnesses, especially illnesses of megalomania, have gained authority over the necks of the servants and the amirship of the Diwans and sectors and land. And nothing is more indicative of that than the fact that whenever the enemy approaches a town or locality to swallow it, those of leadership and influential positions defect to the enemy, or their betrayal appears, or their corruption and negligence appear. And these people did not attain these positions except through the red stamp of the Delegated Committee.
. We were always- even before hijra- warning about doctrinal and manhaj penetration of the Dawla. And among the principles of jihadi warfare and guerrilla warfare: unity of manhaj and doctrine. But here we have reached the time when this issue has become a reality, indeed a true bombshell threatening us with destruction as the senior experts in the global intelligence services have planned for us.
. And as is well-known, at the head of the five necessities that the Legislator [God] ordered us to preserve is religion, and for which we sacrifice when we have been compelled in the rest of the necessities, and they are life, intellect, offspring and wealth.
. So what is the ruling if the authority has neglected the head of these necessities- namely, the religion- and has wanted to bring us out from the doctrine of the Ahl al-Sunna wa al-Jama'a to the doctrines of the people of extremism and takfir and the Khawarij? Answer me, whoso has remained alive from the students of knowledge and the mashayakh. Respond, oh those of cold piety, and show the truth openly before the ax falls on the head, and a fatwa is issued by the Hazimi extremists against you asserting that you are apostates or disbelievers so they deem your blood, honour and wealth permissible. For if we do not declare takfir on the masses, we are disbelievers according to their claim. So show the truth before the river of blood flows. Seek to meet the Caliph for he is the first official before God and before you regardless of those he has delegated from the people and regardless of the trustees he has appointed.
. Another question I leave for the jurists to respond to: what is the ruling on the Caliph who delegates and entrusts all the assignments of the subjects to unknown persons and entrusts to them matters of politics of this world and protection of the religion, and he has no influence or trace or response to what happens to the land and servants? For the doctrine is being distorted and the land and towns are falling one after another, and corruption and tyranny are widespread, and honour is being violated, and the agents and spies are spreading, and the 'ulama and leaders are being killed, and the minds are being numbed through a misleading media and dreams that the darawish of the amirs and their ignoramuses expound giving glad tidings of the promised victory and that after adversity is ease.
. And were any reasonable person to apply his intellect he would know that we will only be victorious by mercy from God, and that is because we have not taken up the causes required for victory, but rather we are closer to the fitna and punishment. The Almighty has said: "And fear fitna that will certainly not strike only those of you who have oppressed, and know that God is severe in punishment" (al-Anfal 25).
. And by God we have not known any of the rightly-guided Caliphs whose direction we claim to be upon that delegated affairs of the state and subjects to a committee of the Companions and sat in his home covered and guarded in fear of being killed, but rather it is wholly well-known that they did not leave alone anything of their competencies delegated to them in law, and they were reviewing all affairs small and great, and three of them were killed in assassination, for Omar was killed but Othman after him did not hide from the people but rather went on the same manhaj, and when Othman was killed, Ali did not fear for himself and went on the same manhaj and did not conceal himself until the Khawarij assassinated him. May God be pleased with all the rightly guided Caliphs and the Companions.
. Someone may say: but they claim that they have the Caliph review all the affairs. I say: the excrement shows the camel and the trace shows the course. Where is the response of the Caliph to the mishaps we are in, and on which only he can rule? For instance, the replacement of the manhaj of the Dawla from a Sunni manhaj to a takfiri Khariji manhaj and ruling and rebuking the traitors and corrupters, and speaking on the successive falling of the towns and cities under the rule of the disbelievers and rectifying it and ruling on it, and other matters elaborated in the books of the people of knowledge and jurisprudence.
. In conclusion we say: the fitna of extremism that the members of the Delegated Committee have kindled by their thoughtless intervention in it openly, and out of adoption and for the interest of external agendas among some of them internally, has caused a fissure that cannot be bandaged among the mujahideen, and trust has become lacking among the brothers as one refrains from ribat and expeditions when he suspects that a brother with him is one of the extremists. And the only person who will put an end to this very great calamity is a Caliph who seizes the hands of the oppressors and cuts them, and rebukes the people of extremism as he disperses them, ostracizes them, imprisons them, demands their repentance and plucks out their heads, and he performs a verification with the members of the Delegated Committee and definitively annuls these theatrics, and is at the head of the mujahideen in the desert, and with him will every devoted mujahid side and support, while every corrupt person and corrupter and every agent and veiled hypocrite will abandon him and flee from him. And by God upon him and them will only occur what God has decreed, and when the rank is cleansed of the traitors and hypocrites and repentance will be collective from the believers, and we take up what remains for us from the causes of force, only then can we expect deliverance and victory from God. And we seek mercy from God for those who repent, and mercy from God on the weak, injured and wounded, and mercy on God for the honour of the believing women and the widows of the martyrs, and mercy from God for the children, orphans and infants. And God's mercy is near those who do good, so do good to yourselves with repentance, and do not forbid these weak people from the mercy of God because of pride, conceit, bragging and lack of repentance. The media is a deadly double-edged weapon, and we were expecting from the Dawla media to play a new role countering the media of the Tawagheet, by being a clear, explicit, honest, inciting and committed media. Yes, it was not contravening the principles of the law, publishing everything for the sake of teaching the people matters of their religion, but it has gone in a misleading direction, numbing the Ummah in that it does not warn the Ummah about the dangers of the aggressive threats that the leaders of the coalition were sending, and it never discussed the best means of confronting and resisting them, and when one of the towns falls, it does not mention this fall from near or afar, let alone discussing the causes of this fall. For the mujahideen were living in ignorance about the imminent dangers to the Dawla, as one of them sleeping soundly while his brothers some 50km away were suffering from siege. The towns were collapsing and falling and many of the mujahideen did not know about their fall until after a month and perhaps more. There was the one who wanted us to live numbed while the plan that Obama had expounded was being applied to us with all ease and calm, and that is dismantling Da'esh's sectors and that would be by seizing the towns one after another. This media has become like the media of the Arab Tawagheet, broadcasting only what the ruler wants. And this is what has made the reasonable brothers definitively end their reliance on Idha'at al-Bayan and the al-Naba newspaper, while looking for news through the Internet. And the dancing nasheeds have also played a big role in numbing, for the media broadcast a nasheed entitled 'Dawlati Baqiya' even as the Dawla is confined and there has not remained for it except al-Mayadeen and Albukamal, and oppression is endemic while another nasheed proclaims: "No oppression or tyranny...as though its judiciary is Omar" and the amirs and walis and thiqat are overcome with negligence, betrayal, tyranny and megalomania except the one on whom God has mercy while one of the nasheeds proclaims: "Its amirs are far from suspicions."
. The manhaj of the Noble Qur'an which should have been followed and practiced by the Dawla's media is to expose the reasons for the defeat and setback and not conceal the truths and cover for those in error, so that the reality should be a lesson and admonition for all the Muslims in that age and afterwards. "When two groups of you were about to lose courage even as God was their ally. And on God should the believers rely"- (Al Imran 122). And they are the Banu Salma and the Banu al-Harith. And before that God the Exalted and Almighty reprimanded the believers for their conflict over war spoils in the Badr expedition, and He resolved the matter precisely and brought them together in faith again.
. And likewise the Noble Qur'an expounded on the reason for the setback on the Day of Hunayn: namely conceit at the multitude in Surat al-Tawba verse 25: merely conceit at the multitude was reason for the Earth to become narrow upon them in what had been wide, then they turned back. So what do we say when we have drowned in oppression and sins, and our amirs have not only been afflicted with conceit but also megalomania except the one on whom God has mercy: wandering aimlessly in the net trap of the mujahideen (al-Mayadeen) and uninterested and unconcerned for the fate of thousands of the mujahideen and injured and wounded and women and children, and not sensing the massive danger that their negligence and oppression and betrayal of trust have caused? And not sensing the danger is one of the features of illness of megalomania.
. The media of the Dawla was meant to proceed on the wise manhaj of the Qur'an, by exposing and showing every shortcoming person and traitor, and just as we make issues on the expeditions, we must make issues that speak about the reasons for the fall of Manbij for example, and we remember that among the reasons for its fall is that the sum that al-Adnani (may God accept him) designated- $500,000- in order to fortify the city was wasted in the form of petty expenses for the Diwans and sectors in the town so this amir responsible for this crime and other officials were presented for trial and their necks were struck in reprimand. All this should be in a special release seen by all the amirs and mujahideen. Don't you realize? Had the likes of this release come out at its time, would all the other towns that fell after it have fallen?!! I don't think so, and if they fall, they will not fall easily or because of betrayal, negligence and shortcoming. In the beginning I must mention that my responses here are limited to that which no one before me has been exposed to in writing, for as noticed the brothers who are 'ulama and students of knowledge have undertaken what is necessary from the realm of responses in the aspect of doctrine and they did not fall short in this regard- oh God- except from the angle of mentioning the dangerous consequences that will follow from the fact that the people of extremism have seized the reins of rule. So may God reward them best and may God accept the blood of whosoever of them was killed because of his steadfastness and firmness on the manhaj, and may God preserve the living among them from the despotism of the oppressors. 1. The statement for distribution of the Delegated Committee ("That the one who perished should perish...") no. h8-t-21 on date 21 Sha'aban 1438 AH.
. The state for distribution asserts with all insolence and arrogance (by implication): Oh sons of the Islamic State, we are the Delegated Committee (the Hujjaj and the thiqat), are more knowledgeable and wise than the 'ulama and the students of knowledge, and we are the ones who decide what the people believe, and the people must hear and obey. Otherwise, you are hypocrites and you will go to the hellfire. I say: this statement for distribution that is before us suffices for evidence of the ignorance of the members of the Delegated Committee and their entourage. And I will not add here because I am speaking here only about their pretenses to knowledge in the field of doctrine and law, and as for their ignorance of military and political and other matters, I will delve into that in their appropriate place if God wills. There was before that some type of modesty and shame- excuse me- or if you like, gradualism in trickery and underhanded dealing in deeds, for the committee issued a previous statement no. 155 and it is likewise paving the way for the people of extremism to seize power through the so-called "Central Office to Track the Shari'i Diwnas" and which was established by Abu Muhammad Furqan and after the unrest that occurred after the issuing of "That the one who perished should perish..." and the multiple responses and the escalation of the crisis, they decided to remove al-Hajji Abd al-Nasir from the amirship of the Delegated Committee and they disseminated among the people that they had put in his place another person who was a judge and a person of knowledge and jurisprudence, and they thus strike two birds with one stone. 1. They calm the souls. 2. They prepare more for the Delegated Committee to be the sole religious authority in the Dawla. 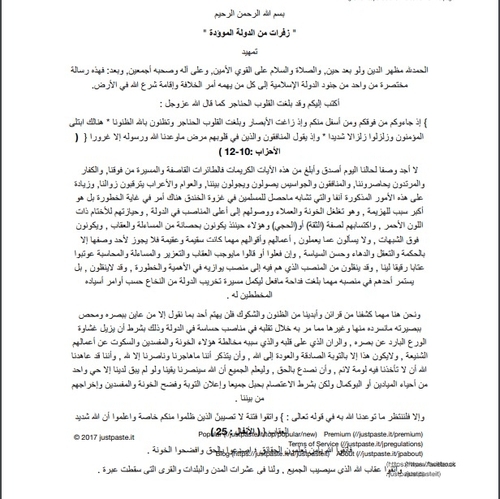 In short, the statement for distribution informs us of a coup of politicians against the 'ulama and Shari'i officials from the Ahl al-Sunna and the adoption of the madhhab of extremism while the movement of the Ahl al-Sunna is weakened. Then they are brought near to them and the 'ulama of evil and the authority come near to them so the Dawla becomes like any jabiri or Taghuti king, but in my personal view this is all to stir up fitna among the mujahideen so each side destroys the other in the time during which the some of the Hujjaj have already arrived in Baghdad.
. 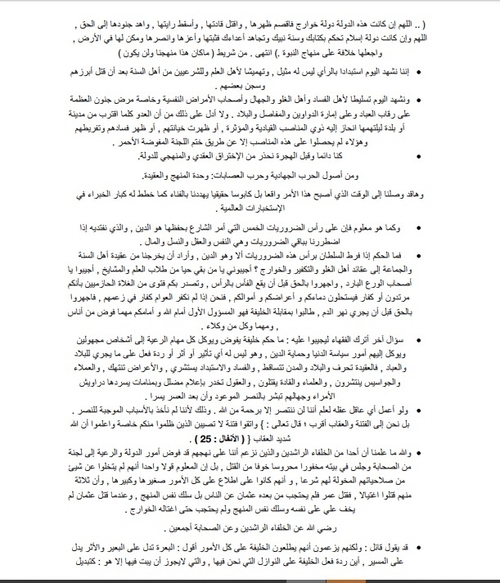 The statement for distribution says (and I quote): "And among them are those who have turned over, for they have broken their pledge of allegiance and fled to the abode of kufr using as a pretext claims of the occurrence of error and shortcoming and negligence and oppression from some of the amirs..."
I say seeking help in God: whoso has moved about in the Dawla knows that the word 'amirs' only indicates amirs of the sectors and Diwans and the walis from the second and third degrees. As for the amirs of the first degree and the members of the Delegated Committee, these people are not called "amir" but rather "al-Hajji"- and this is the norm, and no one denies it. And this issue was related with one of the amirs of the sectors, so he said: "If we doubt the members of the committee, this means we are hypocrites. These people are thiqat with whom the Amir al-Mu'mineen have been pleased, so we do no doubt them ever and this is a matter by which we worship God." So error, negligence and oppression may arise on the part of some of the amirs, but it never arises on the part of the Hujjaj who are the members of the Delegated Committee and its minions. Did I not tell you that some and without realizing have elevated these Hujjaj to the level of infallibility?
. The writer of the laughable statement for distribute puts "oppression" on the same footing as "error and shortcoming and negligence." And this is not allowed, because these three matters do not bring down the kingdoms if they come from some of the amirs, whereas "oppression" destroys the kingdoms and brings them down and it is of greater magnitude than error, shortcoming and negligence.
. His words- "from some of the amirs"- are a clear and plain lie. And were he honest he would say: "from most of the amirs." And this is that of which news has disseminated among near and far. And God is our reliance and He suffices as trustee.
. And the question that suggests itself here: who is the one who appointed these oppressive and erroneous and shortcoming and negligent amirs? Is it not you, oh Hujjaj? And why do you not punish them when their matter becomes clear and their oppression and negligence disseminate and the complaints against them become numerous? Even if they are punished by being removed from their positions, you find them returning to other leadership positions of no less importance than what they were on previously. And the examples of this here are numerous and detailed. Yes, and they are by the Lord of the Ka'aba a policy of planting corruption in the Dawla until the woodworm eats away at them from the inside, so it collapses easily at the hands of the adversary. 2. The speech of Abu al-Hassan al-Muhajir: "And when the believers saw the parties"- Ramadan 1438 AH.
. This man who succeeded al-Adnani as official spokesman for the Dawla is unknown among the mujahideen. I don't know by God how the likes of him can encourage the mujahideen to be patient and endure and to killing and death and annihilation while he is concealed. Subhanullah, has not the time come for you to appear oh Hujjaj, and come out from your caves to be an example mujahideen, and be in the forefront of their ranks?
. The spokesman directs most of his counsels to the mujahideen and murabiteen on the lines of fire, and encourages them to sacrifice, endurance and steadfastness despite the killing and wounds, and as though it has come to him while he is in his ivory tower that the source of the disease and the cause of the defeat are the fighters and murabiteen, and those who in the outset have divorced this world and relieved themselves of it, have breathed their last defiant breaths, and have abandoned the towns and urban areas for the people of discord and hypocrisy who pant behind positions and repose and indifference. It was more appropriate for him to direct his rousing speech to the Hujjaj and amirs and admin officials with whom the streets and bases of al-Mayadeen and Albukamal are packed.
. The spokesman deceives us with the claim that the situation of the Muslims in the Dawla today is like the state of the Messenger (SAWS) and his companions in the al-Ahzab expedition, saying (and I quote): "And likewise the state of affairs today in Raqqa, Mosul and Telafar is exactly like that state of affairs." Subhanullah. Does this man want us to annul our minds and eyes and ears and submit like beasts to his words? Is your Dawla the one in which its religion is replaced with the religion of the Khawarij, its' ulama killed and arrested, a Dawla composed of treacherous, negligent, shortcoming and oppressive amirs, and whose mujahideen are bled in battles and assaults that it is known will be lost before they begun? A Dawla in which love of this world and life and second, third and fourth marriage have seized the interest of its old and young, and etc.? Billah alayk: is it allowed for you to liken exactly your Dawla to the state of the Messenger (SAWS) and His Companions?? The spokesman says (and I quote): "For the Prophet (SAWS) raised the dharya from the women and the young in the atam of al-Medina, and placed their back towards Mount Sela and placed a trench between him and the enemy..."
I say seeking help in God: this is the seal of the Prophets and best of creation, taking up the causes and consulting the mass of his Companions, and expending the utmost efforts to be certain of his work. What have you done?
. Come let us compare what the Messenger (SAWS) did from causes in the al-Ahzab raid so that victory and tamkin should descend upon him, and what the state of the Caliphate has done.
. Salman the Persian (may God be pleased with him) advised him to dig a trench around al-Medina, so the Messenger (SAWS) decided upon that, so he and his Companions dug despite the hunger and severe cold. Do you know oh my brothers what is the meaning of digging a trench in that time, and in an Ummah that does not have mastery of the art of war except fight and flight? This accomplishment dazzled the Arabian Peninsula in its entirety and they stood before it incapable despite their multitude and provisions. And by God indeed it is guidance of God for His believing servants because they exerted effort and expended all efforts despite poverty, hunger and cold, because they took up consultation, and they were not interested in whether this suggestion came from a Persian or Arab, from a young or old person.
. On the contrary: what has our Dawla done to fortify the towns and land? Has it distributed forms to the soldiers to suggest and consult about this matter, or is military strategy confined only to the members of the Delegated Committee and Abu Hamza al-Kurdi (previously amir of the Soldiers Diwan) and those around him from the administrative officials who fight over seizures only? By God, by God and by God, had we torn out the arrogance and conceit in our hearts and the megalomania in our heads, and had we implemented the principle of Shura, God would have guided us similar to the guidance He gave the beloved Messenger (SAWS) and his Companions. Indeed they are the Sunan of God that are not replaced.
. As for the second cause the Messenger (SAWS) took up, it is: the fact that he placed the dharari from the women and young in the atam. Do you know, oh my brothers, what was the value of atam (fortresses) in that age? Indeed atam would stand steadfast before the attackers however great their numbers were for the long months, and indeed also for the long years. And the fortresses did not fall except because of betrayal from within or as a result of mangonel fire. And the tribes of the Arabs did not possess these weapons at that time. And on the contrary: what as our Dawla done to protect the children and women of the muhajireen and ansar and their honour from killing, captivity and violation?? By God, by God, by God, had we been on the guidance of the Messenger (SAWS) and consulted the mujahideen from muhajireen and ansar about this matter, God (Almighty and Exalted is He) would have guided us to the equivalent of atam and fortresses in this age of ours. The Almighty has said: "And those who have waged jihad for Our sake, We will certainly guide them to Our paths. And indeed God is with those who do good" (al-Ankabut 69). But how can we consult a muhajir or ansari about any matter when we are older than he is in the Dawla, and indeed we are the ones who established it and we are the ones who brought and appointed its Caliph? As for this mujahid coming from outside, he must first enter into the first rank, so if he is killed, this is very good, and if he is not killed, we place him in a kitchen or ordinary position regardless of his knowledge, virtue, age and expertise in knowledge or military matters, and this is his just reward for he does not know any Hajji to vouch for him, and he is not a hypocritical flatterer to be elevated.
. And we have seen what the Rafidites have done to the women of the Ahl al-Sunna generally and the muhajireen women in particular in Mosul. Indeed the films that the Rafidites circulated and are then published on the net: no one who has an ounce of faith can bear seeing them without crying like the women. By God, by God and by God: every one responsible for the violation of their honour through his decisions of betrayal will stand before God for a difficult account, and with God will the adversaries gather.
. As for the third reason the Messenger (SAWS) took up: namely that he placed the back of the fighters towards Mount Sela, this is what is called in the art of war: conforming strategy with the geographic situation. And its benefit is economy in forces in the event of defense, and this is realized with strong forces that are ready under the disposition of the command to rectify emergency situations. And likewise we see here complete exploitation of the nature of the land and terrain.
. In contrast: what has the Dawla and the geniuses of the art of war in the Soldiers Diwan and War Committee and Military Academy done for the sake of exploiting the nature of the land from Aleppo to Diyala? And what has it applied from the principles and foundations of attack and defence and general principles of military tactics? The discussion here is long and extended and the disastrous errors many. I will write on it if God preserves me alive on discussing the Diwan of bleeding of the soldiers if God wills.
. And we are still with the official spokesman when he says (and I quote) in exposition of his discussion about the relapsing and the hypocrites as he claims: "...And this person thinks that what the people of the Prophetic traces and the people of hadiths scholarship informed him about from promising signs are merely false desires and void superstitions." If the official spokesman means the ahadith of the fitnas, epic battles and signs of the Hour, I say: the Islamic State in its misleading media and through the words of its leaders has gone way too far in applying the ahadith of fitnas and epic battles to its reality through an indirect method that has led to the growth of embedded masks for the simple mujahideen from the Shari'i angle in that they think that this Dawla is the one that will conquer Constantinople and then Rome, and that one of its Caliphs is the one who will hand the banner to the Mahdi or Jesus (peace be upon him), and some are convinced through visions that Abu Bakr al-Baghdadi is the one who will hand the banner to the Mahdi. And likewise these mujahideen have disregarded many of the disastrous errors, being carried away behind legitimate dreams they want to fulfill, but the tyrants of the Delegated Committee have stabbed them in the back and buried alive their dreams of the rise of a Caliphate state and jihad and implementing the rule of the law of God.
. Applying the ahadith of the fitnas and epic battles to a situation is only allowed through evidence for the texts of the Legislator in this field are absolute and the process of application is restricted by specific, specified personalities, times, places or circumstances. And this restriction, as is well-known, depends on evidence, and the evidence is the extent of applicability of these texts to that situation. And the situation that the ahadith [hadiths] shows, if it has not yet occurred, it is not allowed for us to mislead ourselves and the Ummah and imagine and deceive the Ummah that we are the ones meant in them according to suppositions, thoughts or events that perhaps occur today or after 10 years or perhaps after 1000 years. For the rise of a Caliphate state does not necessitate that we are the ones who will fight in Dabiq or that we are the ones who will conquer Rome, or...or...etc.
. This is so, let alone if this Dawla has abandoned principles and fundamental conditions to attain victory and conquest, for it has been on the religion of the Khawarij and in it have spread oppression, ignorance and spreading of ignorance, and its mujahideen have been driven to losing battles in which they are killed by the hundreds and thousands etc. And the erroneous application built on suppositions and thoughts that may occur in any time or place is speaking falsely against God without knowledge, and prepares the atmosphere for believing the preachers of error or implementing an intelligence plan that leads to the destruction of a group of the mujahideen or detachment of the believers, and we have seen many examples of this. So fear God for the intellects of the mujahideen if you are of the people of taqwa [piety/fear of God].
. Not everything seen in the dream is a vision from God and share from the Prophets.
. Lying occurs in this regard, so adopting the words of every person claiming a vision is not correct but rather the case of the claimant must be reviewed. And regrettably the unknown members of the Delegated Committee continue expounding to the amirs visions they saw or those in whom they trust saw!! And the amirs recount them to the administrative officials and the mujahideen in order to bring about more numbing and hypnosis. And some of the amirs have expounded to us dreams that children laugh at and most of them feature thin cows and fat cows. And many of them speak about the contraction of the Dawla and then its expansion anew.
. The one who speaks of the visions may overlook some of the influential particulars in interpretation.
. The one who has the vision may be honest but the one who expresses does not express it correctly. To the one who is reading me and in particular brothers of the manhaj I say: I am compelled to cut off writing as a result of the difficult circumstances I am going through, and as a result of a feeling, the intensity of whose pain and bitterness cannot be described, resulting from the stab of treachery and betrayal that has struck us from those to whom God has given authority over us. But I will document here the titles of some of the most important things I was going to write, so if God saves me from the scheme of the oppressors and the bombing of the aircraft I will write and send to you. And if I die or am killed, these titles will be an enlightening example for those of the brothers who are saved and have borne witness so that they may write their testimonies to be document and be a lesson and admonition and teachings for the coming generations if God wills. 4. Diwan of the (bleeding) of the Soldiers, which has been negligent of the most precious thing the Dawla possesses: namely the human component (mujahideen) for it has hurled them to death without sufficient training and preparation with failing, treacherous military plans, and the tragedy is that most of those who bear witness to the crimes of the leaders of the Soldiers Diwan and Delegated Committee have been killed. And I swear by God, were many of the military plans to be shown to children, they would discover their fatal defects. 5. Absence of accounting for the errors and negligence and shortcoming in all the sectors, except on rare occasions. 6. Disdain for the capabilities of the enemy, and lack of military and security preparation. 7. Issuing the correct decisions in dead-time, like the decision to train and arm women, and the decision of conscription, and fortifications, and establishing the joke-of-an-office- the central one- to track grievances. 8. Shari'i and da'wa shortcoming in the fronts and ribat and with the masses in the villages. 9. Lack of implementing Shura, and the dominance of tyranny. 10. Human resources: there has been premeditated planning to thwart any attempt to benefit from the cadres and people of expertise and knowledge. 11. Lack of rectifying the ceasing of hijra, and neglecting to deal with the Turkish portfolio. 12. The Hisba Diwan: and the keenness for ignoramuses to be appointed in it and they narrowed the horizon such that most of its work has been confined to isbal, the beard and the revealing of the woman's face. 13. The amirs of some of the Diwans and some of the administrative officials getting involved in business deals and investing their money at the expense of the jihad. 14. Ignorance and spreading of ignorance in the Education Diwan. 15. Shortcoming and negligence in the Diwan al-Qada, and the intervention of some of the members of the Delegated Committee in some of its rulings. 16. Lack of decision on many doctrinal and jurisprudence matters of disagreement, and that led to the dissemination of fitna and conflict and discord among the brothers. And the painful thing is when the disagreement appears on the frontlines and the brothers resent each other while they are confronting the enemy. 17. The farce of the military academy: from leadership of which the founder (Abu Dhir al-Tunisi) was removed and put in place of him was a man who only thought about raising livestock and investing in them. 18. Disregard for the honour of the Muslim women and the lives of children and infants and the injured and wounded, and that is for lack of a plan to save them until this day of ours. 19. The farce of the opinion that asserts that we will retreat to the desert, and the affirmation of its stupidity. 20. The farce of the opinion that asserts that we will cling to the towns, and we will asll die as happened in Mosul, and the affirmation of its stupidity, while refuting the proof of the one who asserts that the situation of the people of Mosul is like the people of the ditch. Attack!! Are you not here to be killed!!? And making clear that the principle is that the life of the mujahid is more important than his death for his life increases the sovereignty of the Muslims and strengthens their power and enrages the disbelievers. 22. The assertion that we do not wage jihad to protect the land and we do not fight to liberate land or seize it; planting in the minds of the mujahideen the easiness of retreat and withdrawal from the land and that the land has no importance. And this is an assertion containing great ignorance even if it comes from al-Adnani (may God forgive him). For the land is an important pillar among the pillars of any state, and the state does not arise except on land that is protected and defended, and these words of ours do not conflict with the fact that the priority is for doctrine. 23. Problems of the Security Diwan and security personnel. 24. Freezing of security work in the region of the north of Wilayat al-Raqqa and the one responsible for it. 25. The plan of the traitors and agents has been as follows: "Deceive those around you that you are working, but you are in truth not working but destroying, and if you are compelled to work, work in a late and very slow fashion and find the appropriate excuses." 26. Notes on the guest houses of men and women. A little while before I learnt that the brother Abu Bakr al-Qahtani was killed after he left a meeting with the Delegated Committee through a drone strike. But I have not been able to confirm the news. And news has come saying he was killed on accusation of kufr. So God is our reliance and He suffices as trustee.
. I conclude my words here by advising my mujahideen brothers to demand that the Caliph come out and his manhaj and position on what is happening be known from his tongue, and that they should demand for the dissolution of the Delegated Committee and verification with its members be performed, for if this is not done, let them turn to the pure war leaders in the desert and carry out their orders: perhaps God will save them. For the Imamate of Abu Bakr al-Baghdadi today is at stake. It is not allowed in law for the Imam to disappear in the likes of these dark days, and leave the matter to the unknowns of the Delegated Committee who have changed the religion and oppressed and been tyrannical, and their stench almost irritates the noses. Oh God, appoint over the mujahideen their best, and do not give authority over them the one who does not fear You for their blood. Oh God, whoso wishes the mujahideen evil, seize him with a mighty and powerful seizure. Oh God, destroy the disbelievers, apostates, traitors and agents and the extremists, for they cannot weaken you. And God's peace and blessings be upon Muhammad and his family. Your brother: Abu Abd al-Malek al-Shami. 1. Many of the soldiers and supporters of the Islamic State until this day of ours do not understand the concept of its collapse and disappearance in the entirety for they are in a state of deep psychological shock the reasons for which will become clear through what I will write, if God wills. Of course I am here speaking about the devoted from the soldiers and ansar, and I am not speaking about the hypocrites and corrupters and agents and traitors or those who have been afflicted with megalomania.
. The fall of towns and areas into the hands of the enemies and the collapse of strongholds and fortresses and the killing of leaders and 'ulama in a very short time have produced this painful psychological shock that weighs down with vanquishing and sadness, and the loss of the will to fight.
. The deliberate policy of making the soldiers of the Dawla ignorant of everything to encourage them and not putting in place back-up and reserve plans in the event of crises, and the numbing and misleading media, and the fiery addresses that have made us imagine that we have neared the conquest of Rome and Paris: these have made the soldiers live now in thought and mental paralysis, and they become by morning and evening in a state of unconsciousness and they run away from merely thinking about adversities and outcome.
. Yes, indeed this shock and its consequences have afflicted all, even those of expertise and experience in Islamic and jihad work, and these people have entered into tis shock and its consequences for reasons among them; that they have been deceived in God so they have been deceived, and because they were far removed from the important positions in the Dawla and have been marginalized so that they should not beware of what is being plotted in secret, and because they have been reluctant to convey their suspicions about some people and some disastrous decisions in fear of fitna, and other reasons that I will explain if I remain alive. 2. A number of reasons have interweaved in the destruction of the Islamic State with this shocking speed, and I will mention here what comes to mind from these reasons in summary, and I draw attention to the fact that one of these reasons is a guarantee for the collapse of any state albeit slowly. As for in our state of affairs, the global intelligence services have taken up these reasons in tandem to destroy the Dawla combined with our own sins, acts of disobedience and distance from taqwa, so the result has been what is happening to us today.
. Arrival of spies and agents to the pinnacle of power, and the centres of power and control, and the red stamps by whose stamp the fateful decisions are taken.
. And these people in their role have entrusted matters to those not suited for them, and have planted the corrupters and ignoramuses and young people in very important leadership positions of administration and military.
. Lack of holding accountable the negligent and corrupters except on rare occasions.
. Lack of commanding what is right and forbidding what is wrong on the part of the devoted and reformers, and fear of being characterized as people of fitna or causing abandonment or etc.
. The manifestation of hypocrisy and flattery and intensive efforts to attain positions even at the expense of principles and religion.
. Tyranny in opinion and rejecting Shura, and the spreading of oppression.
. Ignorance, spreading ignorance, and the misleading, numbing media.
. Planting of the people of extremism and takfir in leadership positions, awaiting the zero hour that was the killing of al-Adnani, and by his killing the reins of matters became entirely belonging to the politicians from the thiqat Hujjaj and the people of extremism, and these people are controlled from above by handless hidden strings whose affair will be exposed at the hour of resolution when their followers afflicted with megalomania will look for them and not find them. Why? Because they will be at that time in Baghdad in the embraces of their masters, and at that time those who have been hypocrites and flattered and those afflicted with megalomania and the mentally deranged from the extremists will know into what end they have plunged, and the time for regret will have passed away. I ask the brothers who are reading not to be irritated at my frequent repetition of the term 'megalomania' and this is because this illness has spread unnaturally in the Dawla, and I have true stories in this regard, which, if I were to expound, you would laugh a lot. For no sooner does one of them gain command over ten soldiers than he becomes afflicted with this virus except the one on whom God has mercy, and the poor person imagines that the obligation and requirement is that he be the Caliph, but thus are the fates of God, and another who was collecting cow dung in his land is given command over hundreds of soldiers and he does not understand how he is to cleanse his soul, for he has been throwing them into assaults until they have all been killed. And when some of them have begun opposing his failing plans, he curses them, reviles them, describes them as the ones causing failure, and says to them: Why did you come here? Is it not so that you can be killed? And this is the tip of the iceberg. 4. And I do not forget to add an important matter and powerful cause among the causes that have led to the abortion of the dream of the Islamic State, namely: lack of entry into a school of the manners of Muhammad (the best prayers and peace be upon him). Indeed the religion and creed and manhaj and principles and foundations, however important and great they are, are not spread and accepted among the people and they do not plant the entity unless good manners accompany them. The Almighty has said: "And indeed, you are of great moral character"- al-Qalam 4. And in this school have the Companions been raised, so they opened their hearts then they conquered the land. And the Almighty has said: "And had you been rude in speech and harsh of heart, they would have disbanded from you" (Al Imran 159). Indeed the takfiris and extremists do not understand these meanings and do not understand that good manners are a Shari'i requirement and obligation because the religion is not spread without it. And all those they see comporting themselves with these manners, they accuse of trying to please the popular support base or sympathizing with the masses. So mutual hatred, quarrelling, disparagement, envy and alienation have spread among the brothers as well, while lack of respect for the elder, knowledgeable and intelligent is the default position.
. The brothers have taken from the Sunna the open features only like sawak, the beard and shortening the garment. As for the hearts, in them have remained the sediments of Jahiliya as they are. We ask God for sufficiency. 6. We have long awaited for the Caliph to come out in voice and picture to make clear to us his doctrine and manhaj after the people of extremism have seized the Dawla and mutually assisted the corrupters and traitors in the Delegated Committee, but he has not come out until this day of ours: Saturday 3 Dhu al-Hijja 1438 AH in a negligence that shocks the mujahideen and every Muslim supporting our causes. 7. If those who know the truths do not announce repentance and disavowal of the traitors and corrupters and the people of extremism who declare takfir even on the Caliph himself if he does not adopt their doctrines, indeed the outcome will descend upon all, and the torment of the Hereafter will be more intense and worse. 8. What is happening today to the Dawla is not a testing as the misleading media tries to deceive us but rather a replacement. We ask God for forgiveness and sufficiency. 9. This bloody painful experience: all who have remained alive from intelligent witnesses must write about it so that the generations can benefit from it. For in the future if God wills there will not be a space in jihadi work except for those who are known going forward and ready, while the unknowns do not rule and exercise control, and it will not be allowed for an ignorant, stupid unknown person to give an fatwa on matters of doctrine etc. 10. The people of extremism have not entered into a jihadi field without corrupting it and therefore beware of them, and the global intelligence services have found in them the most appropriate solution to destroy any jihadi movement. "If the people of extremism are not appeased, they will declare takfir on the Caliph and the Dawla and revolt against it, and so a great fitna will occur. As for the Ahl al-Sunna wa al-Jama'a, it is not in their doctrines to revolt against the Dawla and declare takfir on it for the sake of issues on which there is disagreement over field, therefore there is no fear of them." Yes, this is true to an extent- and this extent is well-known among the people of knowledge- but the mujahideen from the Ahl al-Sunna wa al-Jama'a, when they have seen that the Dawla has become for the people of extremism and the Khawarij into whose hands it has fallen, and they have lost the will to fight (and that is the most precious and important thing the fighter possesses), and when they have seen their 'ulama and mashayakh being wiped out, the most important goal for them becomes leaving the Dawla before being tested in issues of takfir and being exposed to the sword. 11. The people of extremism are not like the old Khawarij from the angle of honesty and open display of doctrine and worship and asceticism and austerity, but rather they are in this age of ours among the worst people in evil, underhanded dealing and cunning in order to attain their desire, and they adopt dissimulation, and they deem lying to be permissible in order to assail the Ahl al-Sunna, and they say: We have dealt with a disbeliever in order to kill an apostate. And they deem it permissible to withdraw from the battles even at their most intense point after the brothers will have trusted that they are participating with them. And they say: this is a war between disbelievers and apostates. And the events in this regard are more than can be counted. And the experience of Algeria with the people of extremism and how they destroyed the mujahideen on their fortified mountains is being repeated here but in a greater and fiercer sense. Mosul, Ramadi, Kweiris [a military airport that was long besieged by Islamic State in east Aleppo countryside] and...by the thousands with treacherous military plans whose outcomes were determined. And God's blessings and peace be upon Muhammad and his family. Until next time if God preserves me alive.